Justin (Latin: Marcus Junianus Justinus Frontinus;[n 1] c. second century) was a Latin writer who lived under the Roman Empire. Almost nothing is known of Justin's personal history, his name appearing only in the title of his work. He must have lived after Gnaeus Pompeius Trogus, whose work he excerpted, and his references to the Romans and Parthians' having divided the world between themselves would have been anachronistic after the rise of the Sassanians in the third century. His Latin appears to be consistent with the style of the second century. Ronald Syme, however, argues for a date around AD 390, immediately before the compilation of the Augustan History, and dismisses anachronisms and the archaic style as unimportant, as he asserts readers would have understood Justin's phrasing to represent Trogus' time, and not his own. Justin was the author of an epitome of Trogus' expansive Liber Historiarum Philippicarum, or Philippic Histories, a history of the kings of Macedonia, compiled in the time of Augustus. 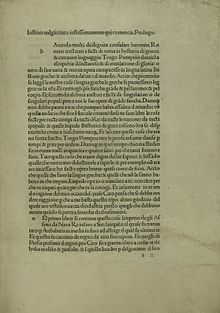 Due to its numerous digressions, this work was retitled by one of its editors, Historia Philippicae et Totius Mundi Origines et Terrae Situs, or Philippic History and Origins of the Entire World and All of its Lands. Justin's preface explains that he aimed to collect the most important and interesting passages of that work, which has since been lost. Some of Trogus' original arguments (prologi) are preserved in various other authors, such as Pliny the Elder. Trogus' main theme was the rise and history of the Macedonian Empire, and like him, Justin permitted himself considerable freedom of digression, producing an idiosyncratic anthology rather than a strict epitome. Justin's history was much used in the Middle Ages, when its author was sometimes mistakenly conflated with Justin Martyr. ^ Justin's name is given only in manuscripts of his own history, the majority of which simply identify him as Justinus. One manuscript identifies him as Justinus Frontinus, the other as Marcus Junianus Justinus. The accuracy of these names is uncertain. This article incorporates text from a publication now in the public domain: Chisholm, Hugh, ed. (1911). "Justin" . Encyclopædia Britannica (11th ed.). Cambridge University Press. Syme, Ronald (1988), "The Date of Justin and the Discovery of Trogus", Historia, No. 37, pp. 358–371 .